As parents, we often aren’t quite sure how to talk to our kids (or their siblings) about sensory challenges. Children’s books on Sensory Processing Disorder (SPD) are a terrific way to educate and get the conversation started. 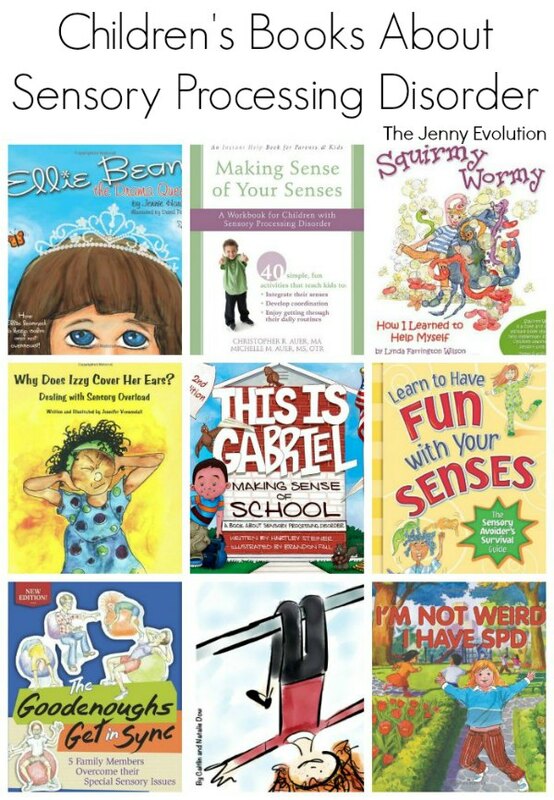 You can find these children’s books on Sensory Processing Disorder at your local library or purchase through the affiliate links provided for your convenience. When we were first managing SPD, I often wondered how I could talk to my child about his sensory difficulties. What I found were books were an awesome way to begin the conversation, help him verbalize how he felt and also help him not feel so alone or strange. Click to read more of my posts touching on Sensory Processing Disorder. 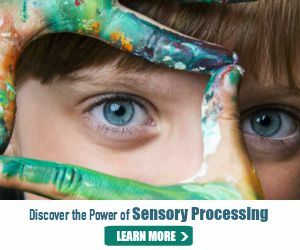 To learn more about sensory challenges or to join our inclusive community, visit The Sensory Spectrum. 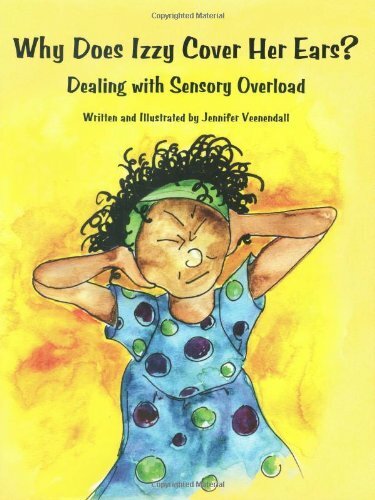 Sensory Like You: n this charming, colorful, and easy-to-read book, illustrated versions of Sensory Processing Disorder (SPD) Adult Advocates, Rachel and Kelly, act as guides for their young, sensational readers. Children will learn about the senses and SPD through their new grown-up friends’ examples, as well as the importance of celebrating what makes them unique. The focus of this book is acceptance. Thanks to their older, trustworthy sensory escorts, children will be reminded that having SPD doesn’t make them less – it makes them wonderful! 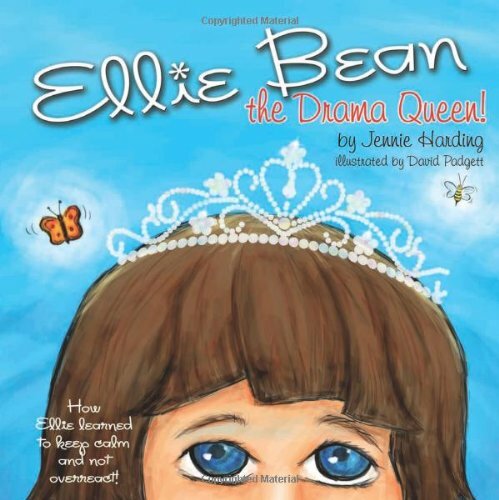 Ellie Bean the Drama Queen: A Children’s Book about Sensory Processing Disorder: Ellie Bean the Drama Queen is an insightful picture book that helps children with sensory issues, and the adults around them, understand what they are going through. Sometimes Ellie Bean seems like she is being difficult, when she realy has a sensory issue that can be overcome quite easily! 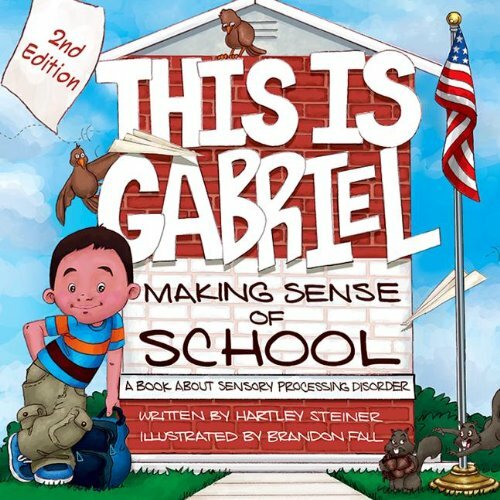 This is Gabriel: Making Sense of School: A Book about Sensory Processing Disorder: This is Gabriel Making Sense of School provides a look into the challenges children with Sensory Processing Disorder (SPD) face in the classroom. This easy to read and beautifully illustrated picture book gives teachers, parents and students a better understanding of all seven senses, how they are each affected at school and what kinds of accommodations are necessary to help children with SPD become learning sensations! Why Does Izzy Cover Her Ears? Dealing with Sensory Overload: Meet Izzy, a feisty first grader, whose behavior is often misunderstood as she tries to cope with sensory overload in her new surroundings. This brightly illustrated book creates an environment that is accepting of students with sensory modulation difficulties, including many on the autism spectrum. It’s a great resource for occupational therapists, teachers, and parents to share with children. Resources for adults at the end of the book include definitions of sensory processing and sensory modulation disorder, suggested discussion questions, and lists of related books and websites. Arnie and His School Tools: Simple Sensory Solutions That Build Success: Arnie and His School Tools: Simple Sensory Solutions to Build Success is an illustrated children’s book about an exuberant little boy who had difficulty paying attention in class and doing his school work until he was equipped with the tools to accommodate his sensory needs. Written from Arnie’s point of view, the book uses simple language to describe some of the sensory tools and strategies he uses at school and home to help him achieve a more optimal level of alertness and performance. Arnie and His School Tools creates an environment that is accepting of students with sensory modulation difficulties, including many on the autism spectrum. 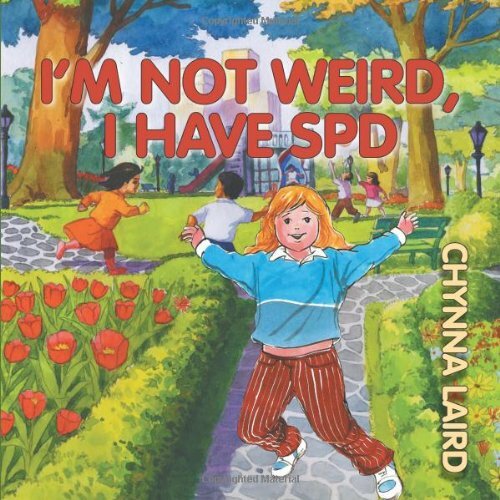 I’m Not Weird, I Have Sensory Processing Disorder (SPD): This book was inspired by the author’s daughter, Jaimie, who struggles with Sensory Processing Disorder (SPD) every day. It was written to validate Jaimie’s feelings and to show her other children feel things the way she does. This book can help children with SPD learn how to explain their disorder to others; help peers understand what children with SPD go through; and also help therapists, teachers and/or counselors learn how to talk about it. Helping others learn about children with special needs brings understanding to them and help to make them seem less… different. 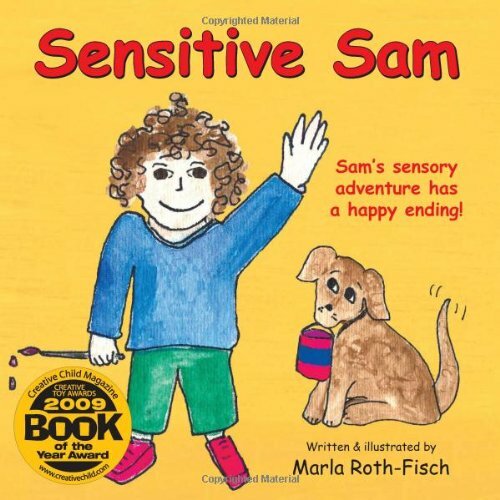 Sensitive Sam: Sam’s Sensory Adventure Has a Happy Ending! : Appropriate for children, families, and professionals, this wonderful book brings to life the story of Sam, whose over-sensitivity creates chaos and frustration in his life. Sam’s various sensory sensitivities adversely affect Sam’s experiences, both at home and in the classroom. He walks readers through his typical day of sensory blunders (which many kids and families may find all too familiar!). I Need Movement ! : ‘I Need Movement!’ tells the story of a little girl who just needs to move! 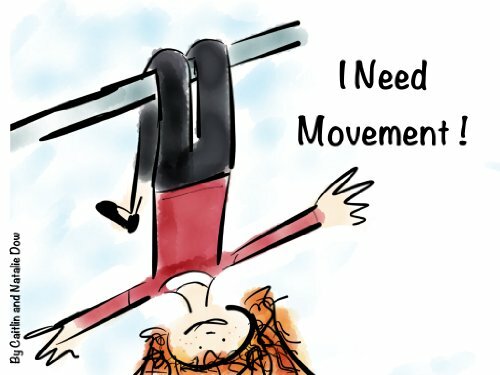 With playful words and colourful illustrations ‘I Need Movement’ explains what it is like in school for children who crave movement and what helps them be at their best. Particularly helpful story for children with Sensory Processing Disorder (SPD) and their parents and carers. Written by a little girl with SPD, with help from her mum, this story helps sensory seekers to see they are not alone and that with understanding they can fulfill their potential. 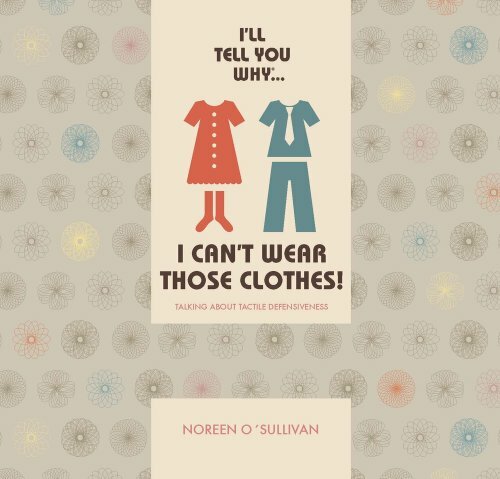 I’ll Tell You Why I Can’t Wear Those Clothes! : Talking about Tactile Defensiveness: Do you know a child who hates the feel of certain items of clothing? This is a child’s perspective on a largely unrecognized condition called tactile defensiveness, a physical condition that causes hypersensitivity to certain touch sensations. 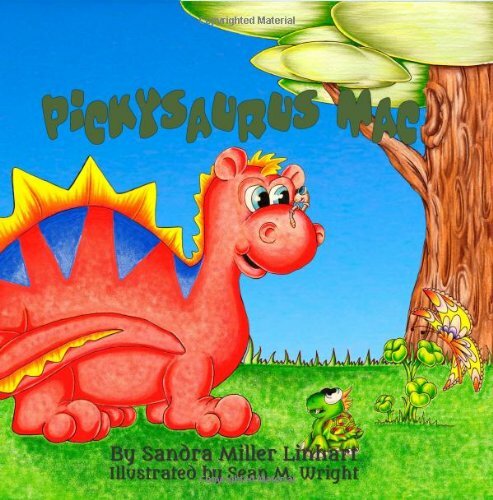 Pickysaurus Mac: Pickysaurus Mac is not your typical dinosaur. Mealtimes pose a special problem for our picky little friend. Sometimes foods smell too gross to eat, they taste different than they look and their textures feel like garbage in his mouth. His friends tell him to eat right to stay healthy, but some things you just can’t fix with words. Will Pickysaurus Mac ever find something he likes? When he finds he likes it, will it be the best food for him? Will he find it in time? 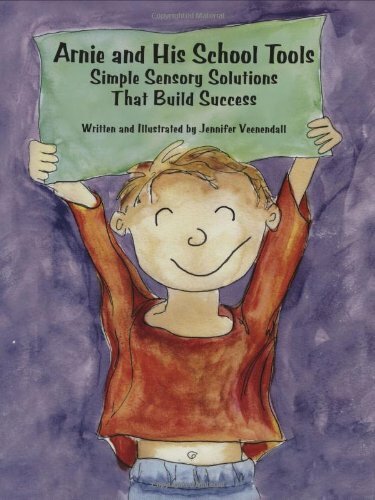 If you have kids in elementary school and older, you may want to consider the following books on Sensory Processing Disorder that can help children have a deeper understand of their sensory challenges and how to address them. 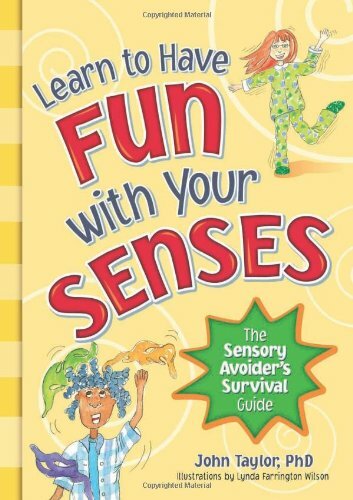 Learn to Have Fun with Your Senses! : The Sensory Avoider’s Survival Guide: This book represents an introduction to the human senses for kids. It might be your child’s first “read about your own problems” guide. It explains what can go wrong when the brain inappropriately magnifies the messages sense organs send to it. 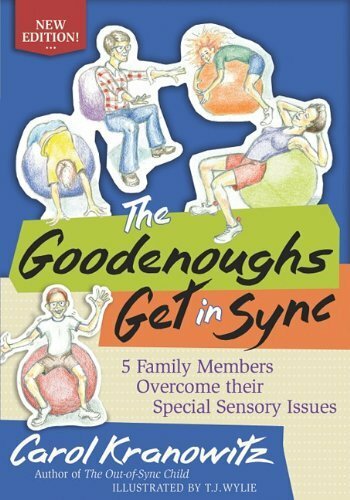 The Goodenoughs Get in Sync: 5 Family Members Overcome their Special Sensory Issues: This delightfully illustrated “chapter book,” geared for 8-to-12 year olds, tells the charming tale of five family members and their naughty dog (each with a different sensory processing challenge), and how they get in sync after a tough day. The book is designed with the action of the story in larger print for younger readers to read or hear. Explanations of sensory processing issues are woven throughout the story in regular type for proficient readers to linger over at leisure. 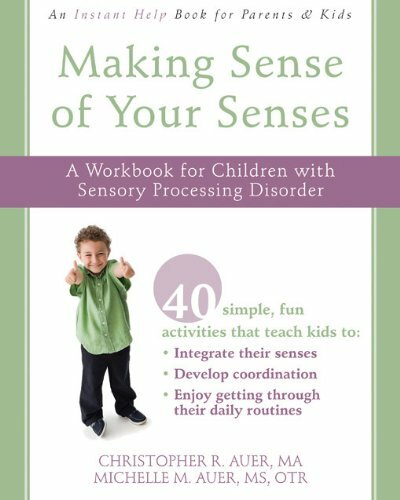 Making Sense of Your Senses: A Workbook for Children with Sensory Processing Disorder (Instant Help Book for Parents & Kids): Making Sense of Your Senses is full of activities and skill-building exercises you can do with your child to help him or her balance sensory stimulation and practice self-calming techniques. Kids can use these techniques anytime they feel overwhelmed or have the urge to seek out intense sensory experiences. Before long, your child will be better able to tolerate everyday sensations and prevent stimulation overload—essential skills for living a happy, healthy, and comfortable life. Like these books on sensory processing? Find even more engaging book lists for kids with more than 100 book-themed reading lists! It is good to see that it is becoming more and more covered. Great selection of books. I have pinned. It is good to know there are more books coming out… many are from parents who have sensory kids and were disappointed that there weren’t books out there to share with their own children. This is super helpful! Thanks so much for this resource! You’re welcome! I’ve read every single one of these books at one time or another with my own sensory boys. They’ve been SO helpful. What a great list of books! I didn’t realize there were so many books on this topic! I will definitely bookmark this page as a reference for my therapy practice. Thanks! Wonderful! These books are around… but you have to search. Over the years, I’ve ready every single one to my boys for one reason or another and they’ve all proved helpful.